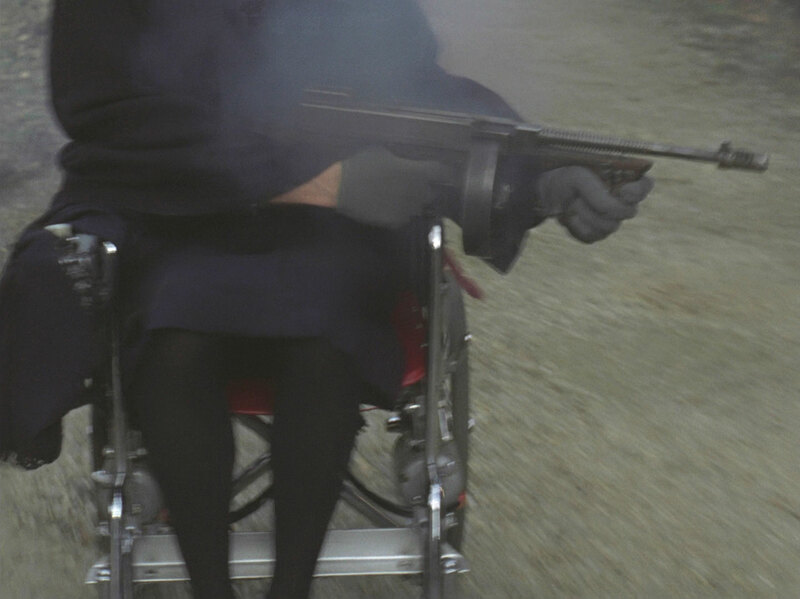 MoD agent Dodson (Dennis Chinnery) is chased to a secluded house by an old woman in a wheelchair. He calls General Wilmot but only reaches his aide, Dawson. Before Wilmot can get to the 'phone to talk to him, a child's ball crashes through the window and when he picks it up he starts hallucinating, imagining himself back in the nursery. A nanny enters and tells him not to be naughty, and to give her his gun - he does so, and she shoots him with it. 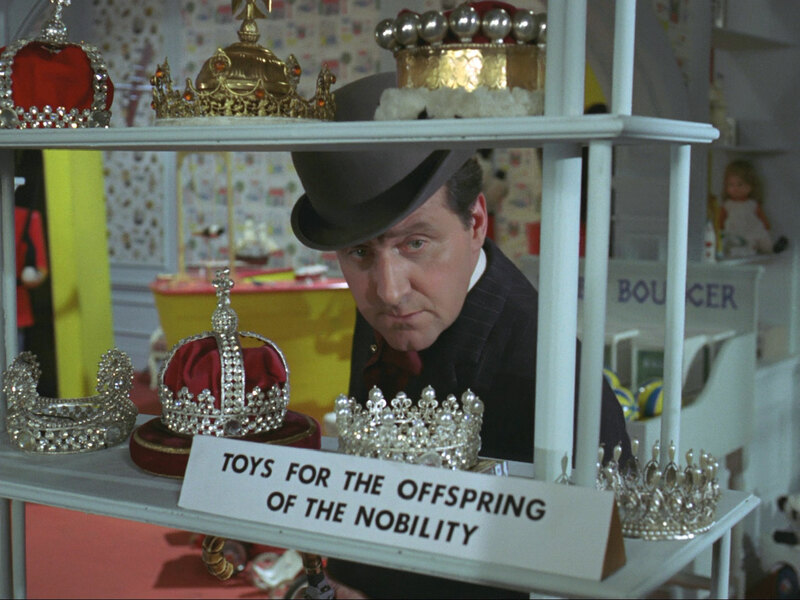 Mrs Peel is roused by a toy merry-go-round, one of the figures bearing a banner emblazoned 'MRS PEEL' - another of Steed's quirky summonses and he appears saying, "we're needed". They visit the scene of Dodson's demise where Wilmot (Geoffrey Sumner) tells them he was onto a security leak which had been narrowed to three suspects, all supposedly above reproach - Sir George Collins, son of the Attorney-General; Viscount Sir Frederick Webster, DSO and bar; and Lord William Beaumont, cousin to a prince of the realm. Wilmot tells Steed to meet the suspects at Beaumont's house and he leaves. Emma has noticed a scent of old lavender in the room but it's ascribed to the general. Beaumont (Paul Eddington) is working at his desk when a ball bounces in the French windows, and he too regresses to childhood, greeting his nanny... Steed and Emma arrive outside and find Collins and Webster (Patrick Newell and Paul Hardwick) at the front door, receiving no reply to their knocking. Steed leads them in	through the French windows to find Beaumont dazed but overly cheerful,	mixing them drinks and slapping them on the back. Steed presents evidence that secrets from their last meeting have been leaked and all are astounded when Beaumont angrily screws up the papers and bowls them at a waste paper basket. Meanwhile outside, Emma has found an empty wheelchair which disappears as she searches the thicket. 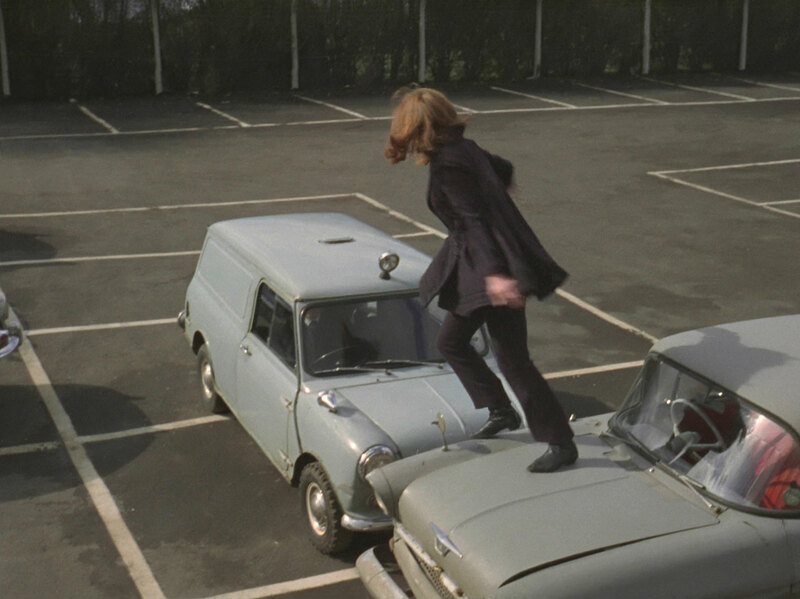 Beaumont bangs his head while retrieving the papers, and mentions "Old Roberts", causing Webster to drop his glass in shock then leave hurriedly, Mrs Peel following him in her car. Collins leaves a few minutes later and Steed is free to question him about Roberts, who he reveals was his nanny, of whom he had just dreamed - but he doesn't even know if Nanny Roberts is still alive. Webster arrives home, not noticing a man parked outside in a Mini, and orders his elderly butler, James (George Merritt), to fetch photos of himself with his nanny from the basement. Looking through them, he realises he, too, has dreamt about her recently and keeps one. James returns to the basement and is attacked by a nanny, and when Webster investigates a ball bounces down the stairs; he picks it up and starts hallucinating. Mrs Peel arrives and the	man on watch raises the alarm. When Emma enters she finds Webster asleep, the ball, marked "Martin's Toy Shop", still in his grasp. She takes the photo and investigates the basement where she has a halberd thrown at her by an unseen assailant and discovers James' body. 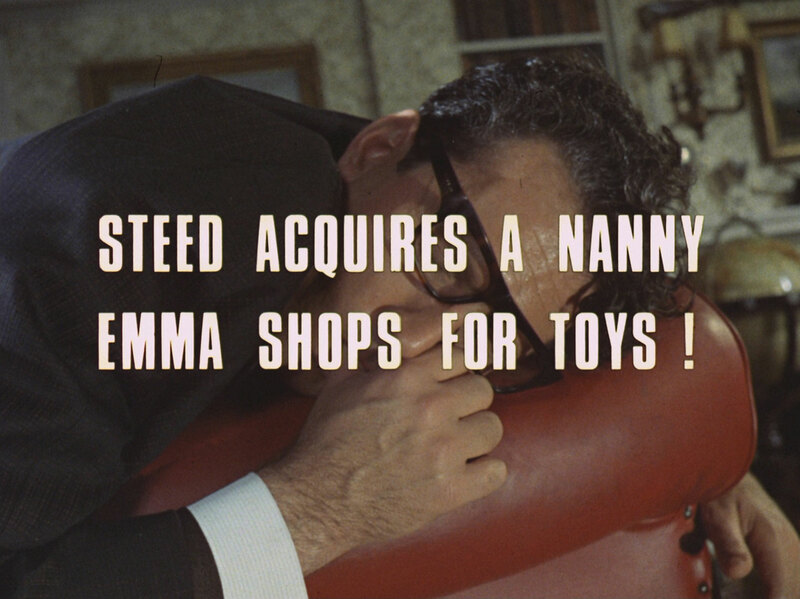 Beaumont, meanwhile, recalls how Nanny Roberts always wore Old Lavender and that the ball was a 'baby bouncer', sold only by Martin's, the toy shop for the nobility. Steed visits the shop, J.W. Martin & Son & Son & Son (established 1780), where he meets the current Martin (Clive Dunn). 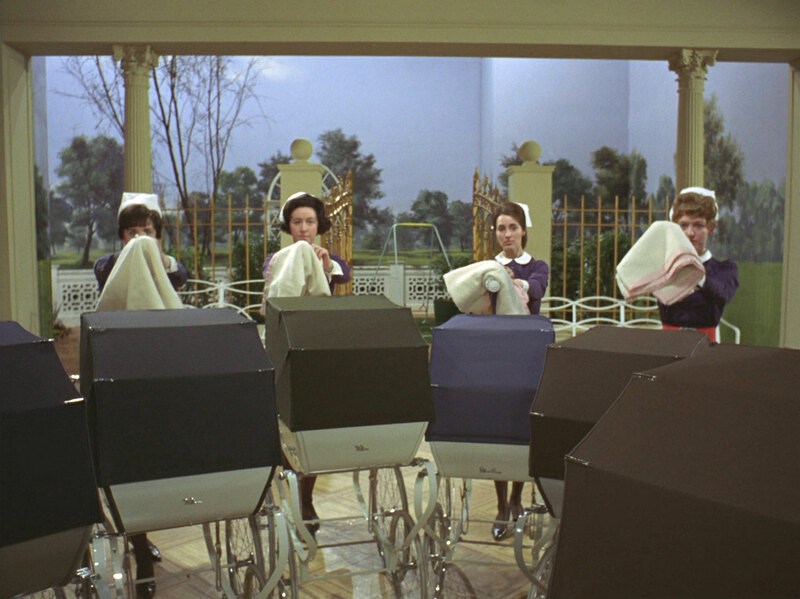 Martin becomes a bit snooty when Steed concedes he's 'only a Mister' and refuses to sell him any of the baby bouncers, as they're specially made to a client's own design; "They're GONN". "Gone where? 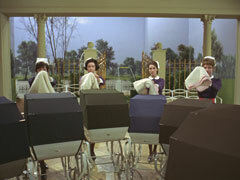 ", asks Steed and Martin explains that GONN is the Guild of Noble Nannies. Sir George gets into his Rolls, finding a ball on the seat... this time Emma arrives in time to interfere and Gordon tries to run her down in the car park. She evades him and sees a nanny run and jump into the back of the departing Mini. She checks Collins, who's dreamily reciting "Georgie Porgie", and confirms he's just dreamt of Nanny Roberts. Steed is shown in to see her, noticing a bottle of Old Lavender, but when she doesn't remember his name Gordon checks the books, discovering he was never her charge. He takes a ball to Steed's apartment, and it bounces down the stairs - only this time it's a pantomime bomb which Steed hurriedly sticks in his tuba and fires out the window. Gordon returns and is told the conference has been cancelled so they're going right to the top. Steed hurries back to Martin's, but a nanny has just delievered a jack-in-the-box - they've realised how Steed got onto them. He enters and Martin is more communicative but a gun leaps out of the box and kills him before he can reveal anything other than that the baby bouncers were all collected an hour ago. Steed is explaining that Roberts is probably being used by the enemy when a baby bouncer breaks the window and Wilmot picks it up, as does Steed when he drops it. A nanny walks in - Goat in disguise - and calls Wilmot "Cuddles". Lister suddenly spots Steed, but Goat thinks he too has touched the LSD-impregnated ball and is harmless. They get Wilmot to put toy missiles on a map of Britain to mark the nuclear bases locations, and give him a gun, telling him he's a cowboy and Steed an Indian, but he's not to start playing until they've gone. 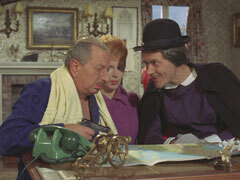 They go to take the map, but Steed has it in his teeth, apparently pretending to be a dog. He rips it into pieces and Lister notices he's wearing gloves. 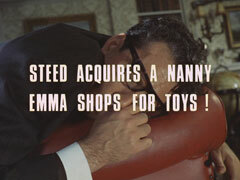 Steed launches himself at Goat, just as Emma arrives to take care of Miss Lister. Goat pulls a gun on them, demanding the pieces of the map and Wilmot shoots him, declaring, "You're not my nanny!". The Avengers retire to gaze into a crystal ball, Emma seeing a précis of an Avengers episode and the words 'watch next week'. 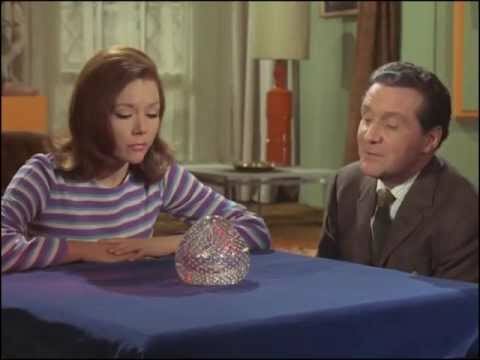 Steed tries it, but his visions are too lurid for Mrs Peel, who demurely covers the ball.